Lionel “Leo” Messi makes professional defenders–great defenders–look like fools. His dribbling recalls great players like Diego Maradona, and his ability to keep the ball in close to his body and change direction explosively is why he’s widely considered one of the greatest players of his generation, and maybe one of the greatest players of all time. If you want to learn how Messi dribbles, you can start building the fundamental dribbling skills and juke-maneuvers he uses to up your game to the next level. See Step 1 for more information. Keep the ball close at all times. Messi and other great dribblers keep the ball extremely close to their body as they move, almost as if it were glued to a short rope around the ankle. To build your close-dribbling skills, practice snaking through cones as quickly as possible. You’ll force yourself to control the ball and keep it close to make it around the cones without going all wonky. It’s important to practice as a quick clip. It’s easy to keep the ball close while you walk around, but it’s much harder to do at a full sprint. Gradually build up your speed and your dribbling stamina, aiming for a touch on the ball every 2-3 strides. Keep your head up. 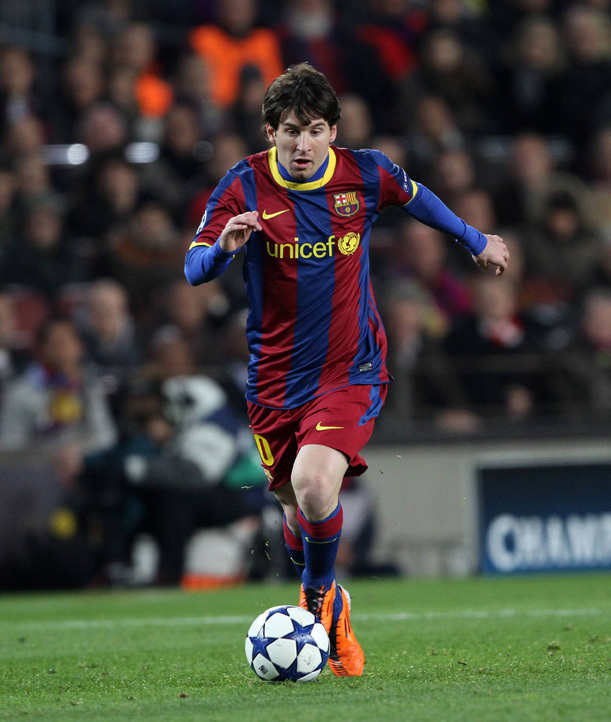 Good vision is essential to good ball control and excellent Messi-style dribbling. Practice keeping your eyes looking up at the action around you, focusing on defenders hips to see which direction they’re moving so you can anticipate the best way to get them off balance or even catch them with their legs spread for a morale-killing nutmeg. Establish a low center of gravity. It’s almost unfair: Messi is a great dribbler in part because he’s short. Not that height makes you a better dribbler, but he takes more strides per dribble than some other dribblers, and he’s forced to keep the ball close, taking short little quick steps as he moves. Taller players can do the same thing, but it’ll take more practice and helps to center yourself low, squatting and staying on top of the ball. Keep your arms out. Remember how Jack Sparrow walked in Pirates of the Caribbean, arms out to steady the drunkenness? Watch some tape–great dribblers like Messi dribble like that. Keeping your arms bent and slightly out from your body allows you to maintain your balance during quick transitions and changes of direction, keeping yourself in the best position. 5. Get faster. Speed is one of the major keys to Lionel Messi’s style of play and his ball control. Being able to keep the ball close at fast speeds is what distinguishes Messi from average players. To work on your speed, do wind sprints with a ball. Try and go as fast as you can with as many touches on the ball as possible. Time yourself and work on getting your time faster from one end of the field to another. Run lines, or suicides. To build your fast-twitch explosiveness, start running suicide drills that’ll have you moving back and forth across the field, from the goal line to the 6 yard (5.5 m) box, the 18 yard (16.5 m) box, mid-field, and back. Play constantly. In an interview, Messi was once asked what it took to become a great player like him and he said that they key was to love the game and play it constantly. From the age of 3 on, Messi played every day, morning, afternoon, and night. He played inside and got in trouble for breaking things. As soon as he could walk, he was dribbling a soccer ball. Do the same. Shield the ball with your body. Put your body between passes that you receive and any defenders around you. Turn your hip or you back to the defense and try as much as you can to shield the ball from them. Messi will often already have his eyes up and looking over his shoulder at an opponent as soon as he traps the ball. Accept passes with the foot farthest from your opponent. When you trap a pass, try to do it by controlling it with the foot farthest away from the opponent. Though Messi often gets close enough to touch the defense, he’s always got the ball closer to him and his center of gravity than his opponents. To start off on the right foot (ha! ), accept the pass and trap it to create space in which to work. Locate the space. Keeping your eyes up, decide which direction is more likely to allow you enough space to maneuver around the defender. His hips won’t lie: Look closely at the defender’s hips to see which direction they’re turned and what he seems to be anticipating you’ll do. If you’re right-footed, most defenders will instinctively guess that you’ll go right, which might be your natural tendency anyway. Use that misconception to your advantage. Bring the defense in by stepping in the opposite direction you want to go. Control the ball with the foot that matches the direction you’re eventually going to go and take a step with the other foot. Messi’s signature move happens so quick it’s easy to miss, which is why it’s so effective against defenders. Basically, to juke out a defender, Messi takes one stutter-step in the fake direction, feints, and then dribbles in the opposite with the outside of his foot. Approach the defender slowly. Messi brings the defender in and forces him to reveal his hand and make a mistake before blowing past them finding space. Messi isn’t a flashy dribbler like Ronaldhino or a master of the step-over like Cristiano Ronaldo, he just uses simple changes of direction and ball control to do inhuman looking things. Drop it into high gear when you decide to switch direction. Blow past your opponent by flicking the ball in the direction you want to go and moving into your quick-dribble that you’ve been practicing so aggressively. You don’t have to go super-fast to find space, you just need to make the smart dribble and catch the defender flat-footed and out of position. He won’t be able to touch you. Always try to keep control under the ball. Be ready to knock the ball past the defender if or when he lunges in to get the ball. Most importantly you must have flexible body language. When you run, you must run slow, then lob the ball fast and then run across. Practice, until you get better and better at it. Be careful. The Dribbling technique (which you learn with lots of practise) is going to go away if you have too many breaks…. even after 5-6 months regular practising, it can still happen. If you practise every day, one day you might become like Messi. Stop drooling. If you really want to dribble like Lionel Messi, it’s not an art you’re going to be able to pick up overnight. Not unless you happen to be football’s next boy wonder (thought not)…Then again, there’s certainly no harm in taking lessons from one of the greatest players of this or perhaps any other generation. So, here are our five top tips to play like ‘La Pulga Atomica’ (The Atomic Flea) himself. We can’t promise you a fast-track route to one of football’s great cathedrals- but we might be able to help make next week’s opponent feel hapless, cross-eyed and a little less assured. Mark out various training exercises using cones at different distances and angles to vary your running stance. Start the exercise by initially working without the ball. Instead, focus on your balance, your reactions and your ability to accelerate and decelerate. Concentrate on exercises that require a lot of short, sharp turns in small, tight spaces. Body shape is key. Despite Messi’s diminutive stature, he uses his low centre of gravity to devastating effect by adopting a powerful running stance to change pace suddenly in different directions. When do you introduce the ball to the drill, focus on touching the ball with each step and with both feet, gradually building up speed and momentum. Sounds simple enough, but it’s a fundamental art that even some of the world’s leading players have yet to fully master (Theo Walcott anyone?) Keep the ball moving on either foot. Whether you walk, jog or sprint with the ball, it’s important not to kill the ball dead altogether. 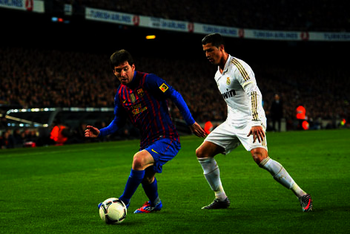 Messi has a deliberate running style, which involves attacking his opponent head-on. This reduces the amount of time the opponent has to set himself for the attack and keeps him guessing about the next move. Messi’s dribbling style is simple yet devastatingly effective. He does not rely on the turbo-charged pace and strength of a player such as Gareth Bale, nor the power, electrifying footwork and trickery of Cristiano Ronaldo. Instead, he elects to run directly at his opponent and uses his balance and turn of pace to slalom his way into space behind the defender. Vary your play to ensure there’s a purpose to every attack. Messi’s greatest asset is his decision making. He rarely loses the ball; he’s thoughtful and happy to embrace his role as a team player. Even if you’ve got the beating of a particular opponent, the element of surprise can be equally as effective. Whether you attempt to go inside or outside, attempt to take one touch or six, apply a one-two or use trickery, just don’t be predictable! Excellent website. Plenty of useful info here. I’m sending it to several buddies ans also sharing in delicious. And obviously, thank you in your sweat! I used to be more than happy to seek out this internet-site.I wanted to thanks on your time for this glorious learn!! I definitely enjoying each little bit of it and I’ve you bookmarked to take a look at new stuff you blog post. Thank you for every one of your work on this blog. My niece enjoys managing investigations and it’s easy to see why. My partner and i hear all about the dynamic manner you offer practical suggestions through the blog and as well invigorate contribution from website visitors on the point so my girl is now studying a lot. Enjoy the remaining portion of the year. Your carrying out a great job.